Do you want to quit smoking, or care about someone who does? Webster Wellness and The American Cancer Society (ACS) urge people to use this date to sit down and make a plan to stop smoking. Another option: Planning ahead and making the Smokeout on Nov. 17 your quit date. Home Campus Event Nov. 17 - Cold turkey, anyone? Information tables with activities, games and signup sheets for our tobacco cessation support groups hosted by St. Louis County Health Department will be in the East Academic Building, Emerson Library, University Center and Marletto’s. While supplies last, “cold turkey” sandwiches will be served in Marletto’s and the University Center from 11:30 a.m.-1 p.m. to people who draft a quit action plan, quit smoking for the day or sign up to participate in the tobacco cessation support group. Informational meeting tentatively scheduled for Wednesday, Nov. 30, at 11:30 a.m.
Sign up on Thursday or send an email to wellness@webster.edu to get more information. When you snuff out your last cigarette, you take a brave and powerful step toward a better, healthier life. Quitting can improve your breathing and lower your risk of heart disease, stroke, cancers, chronic obstructive pulmonary disease (COPD) and other life altering illnesses. Remember, if you give up smoking, you’re not the only one to profit. Quitting means you will also stop exposing your family and friends to toxic secondhand smoke. In the meantime, please respect the Webster University smoking policy: smoking is prohibited within 30 feet of building entrances. 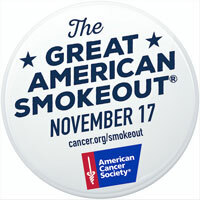 To learn more, visit www.cancer.org/smokeout. You’ll find tips and tools for people who want to live tobacco-free lives.